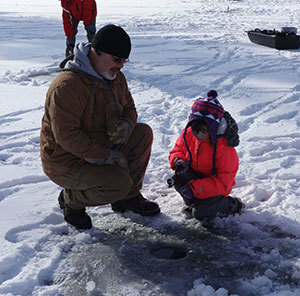 February’s Free Fishing Weekend is a great opportunity to try ice fishing for the first time or for experienced anglers to introduce their friends to ice fishing. No fishing license is required during the weekend. All fishing gear is provided at these clinics, which will be led by DEC staff. Activities include ice fishing, snowmobiling, snowshoe hikes, ice skating, and a campfire with s’mores and hot chocolate. Cross-country skis and snowshoes are available for visitor use.